Manchester University donated 20 laptop computers to the Learn More Center, with the official presentation on Monday. 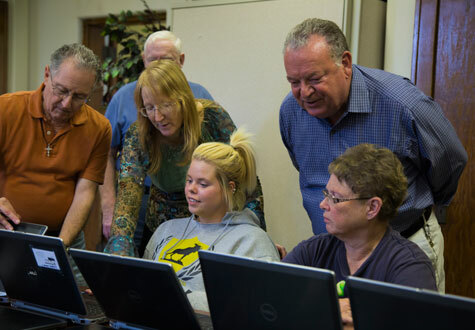 The laptops were previously used by pharmacy students at the Fort Wayne campus of MU. When the fourth-year students upgraded to new devices, the University ended up with unused laptops. Learn More Center will use half of the laptops at the North Manchester Learn More Center and the other half at the Wabash Learn More Center for adult education, primarily for those striving to earn their high school equivalency diplomas, said Cynthia Johnson, director of education at the center. They will also be used by those who are already in higher education or prepping for it, which is about 20 percent of the Learn More Center students. Each center will now have a total of 20 laptops, enough to keep half a dozen in each classroom and have others to loan out so students can work at their own pace at home. Learn More Center students, staff and officials were on hand Monday as Johnson received the laptops from Jack Gochenaur, Manchester University vice president and chief business officer.